The best way to characterize version 12.05 of the Genode OS Framework is to dub it as feature release. Among the numerous additions of new functionality are a new USB stack, media replay capabilities, and the ability to run the GNU tool chain including GCC, G++, Binutils, and GNU Make directly on Genode. That said, the current release is not short of architectural improvements either. The highlights are the introduction of Genode's file-system infrastructure and a new concept for the dynamic adjustment of the system's behaviour at runtime. The release follows the rough plan we laid out in our road map. One planned road-map item was revisiting our base of device drivers as we realized that some important drivers were not on par with our requirements, the USB stack being the most important example. Our prior existing solution was originally ported from Linux 2.6.20. It is needless to say that this version is severely limited when it comes to the use of modern hardware. Instead of continuing to walk the path of the existing solution, we took the chance to fundamentally re-approach the problem of porting a complex driver subsystem from the Linux kernel. We are happy to have found a new methodology that promises to become a much more sustainable solution for Genode. The rationale behind the new development is described in detail in section Re-approaching the Linux device-driver environment. The second major road-map item refers to the Noux runtime environment, which enables us to run a growing number of unmodified GNU programs natively on Genode. The abilities of Noux have taken a giant leap forward. The two most significant improvements are the support of stacked file systems and networking support. With those in place, we have become able to run most parts of the Genode tool chain including GCC, G++, Binutils, and GNU Make via Noux. Thanks to the added networking support, we are able to use basic networking tools such as netcat as well. The third topic according to the road map is file-system support. Version 12.05 contains the groundwork for this domain. The foundation is the new file-system session interface. A first implementation of this interface is available in the form of an in-memory file system. To enable the use of Genode's file-system facilities by applications, we added support to the C runtime as well as to Noux. In addition to the features planned according to our road map, there are many new functionalities and improvements. To name a few: By enhancing the existing configuration concept described in section System reconfiguration at runtime, we principally enable components to respond to configuration adjustments on-the-fly, which clears the way for elegantly solving many problems typical for general-purpose computing. The port of libav accompanied with profound changes of our version of libSDL enables us to replay media data. The Fiasco.OC base platform has received a lot of attention to fully leverage the kernel's capability concept. Last but not least, the port of Lua interpreter allows for using this popular scripting language on Genode. The release of version 12.05 is accompanied with a slightly updated road map. The persistent storage topic has been traded for our media player because the former one naturally builds upon the just recently added file-system interface. Furthermore, we decided to defer the live CD until July as we realized that we first need to overhaul low-level components such as USB before the new live system can be expected to work as intended. Also, some of the scenarios we want to present depend on framework features just introduced with the current release, in particular the file-system infrastructure and the media capabilities. User-level device drivers are a never-ending quest for microkernel-based systems. The two most extreme approaches are the development of a custom driver base developed from scratch, or the use of a virtualized OS as donor of device-drivers. An example of the former approach is the HelenOS project, which aspires to conduct the development of all needed device drivers within the project. The latter approach also known as device-driver OS is domesticated by NUL (NOVA userland) for networking drivers and the L4Re (Fiasco.OC userland). For Genode, neither of both extremes seems to be viable. For the sake of argumentation, let's consider USB support as an example. We deem the development of a new USB stack from scratch as a far too elaborative undertaking, in particular when looking at the functionality we desire. The feature set of HelenOS's custom-built USB stack is quite illustrative. It supports HID and USB storage, yet no high-speed devices, nor even more sophisticated features such as USB 3.0. On the other hand, using the device-driver OS approach just for providing USB support is unfortunate when considering that even the most basic devices such as keyboard and mouse depend on a working USB stack. We would pull in a complete OS kernel (donor kernel) just for the sake of handling user input. Furthermore device drivers do not come for free even when using an unmodified donor kernel. Integrating the donor kernel with the remaining Genode system requires glue code interacting with the donor kernel. This code would translate driver API calls to Genode RPC interfaces. Even more importantly for us, the use of a device-driver OS requires a base platform with support for virtualization. But there is no virtualization solution that works across all of Genode's base platforms. Quite the contrary. We experience that each virtualization solution such as L4Linux, OKLinux, or Vancouver, is largely tied to a particular kernel (Fiasco.OC, OKL4, or NOVA respectively). Therefore the device-driver OS approach defeats Genode's inter-kernel portability. Even if we had a portable virtualization solution at hand, we still would have the problem that for providing the device-driver service, we need to trust the donor kernel to a certain degree. If the driver uses DMA, the whole donor kernel must be trusted not to misuse DMA. Even though IOMMUs are apparently able to relief the problem, they are far from being a magic bullet for solving it. The naive way is to identify the driver code in the source code of the donor OS, copying it over and massaging it until it works well in the new environment. There are two fundamental problems with this way of porting. First, there is a high likelihood to insert new bugs in the process of modifying the imported 3rd-party code. But more importantly, each update of the driver to a new version requires the developer to revisit the modifications. In many cases, the rationale behind certain changes gets lost over time. The consequence is that updating drivers becomes a largely dissatisfying kind of work for which there is always a good excuse to not take it on. To limit the trouble of maintaining 3rd-party drivers, the number-one rule is to not modify 3rd-party driver code. The much better alternative is to embed the unmodified driver into a so-called device-driver environment. (DDE). From the driver's perspective, a DDE looks identical to the donor OS. But the DDE makes the driver talk to custom glue code instead of interacting with the donor OS kernel. This raises the question of how to create a maintainable DDE. The first attempts to create a DDE for Linux device drivers came down to a mix of reimplementing some of the Linux APIs, taking some other portions of the Linux kernel as is, and modifying some Linux headers to a certain degree. Each of those categories has its own set of problems. By reimplementing Linux APIs, one risks to introduce bugs by not implementing the exact behaviour as the Linux kernel. Because most Linux APIs have no clear specification other than the kernel code, it is sometimes hard to capture all semantic details. The problem of introducing bugs can be alleviated by reusing original code wherever possible. For example, instead of providing custom memory allocators, it is tempting to just reuse the Linux slab implementation. The downside of reusing existing code is, however, that such code tends to depend on further kernel code. Pulling-in the transitive dependencies leads to more dependencies etc. The temptation of just continuing to add more and more unmodified kernel code into the DDE can easily go out of hand. One way to cut out such undesired dependencies is to slightly modify (parts of) the kernel code. Unfortunately, the category of slightly modified code usually turns out to become an ongoing maintenance burden. The bottom line is that finding the right mix of reimplementation, slight modification, and reuse is a matter of sure instinct of the DDE developer. Another way to put it is defining the problem as the search in an optimization space for the economically most sensible solution. The optimization criterion we set out to maximize is the ratio of feature code (the actual driver, no DDE nor glue) to the number of lines of code that must be manually maintained. To give the order of magnitude of the code we speak of, the traditional Linux DDE including the support for NIC, USB, and sound is comprised of more than 350.000 lines of code. The portion of modified or custom written code (code that must be manually maintained) is more than 40.000 lines of code. Given this complexity, we found us hesitant to update the code to newer kernel versions. The engineering labour of such an update is significant yet not much of a rewarding work. Apart from the burden of managing a piece of software that complex, our confidence in the classical Linux DDE approach slipped further with each debugging session that involved Linux DDE. In our experience, Linux DDE still significantly deviates from the semantics of the Linux kernel but in subtle ways. Often problems go unnoticed until a driver uses a kernel API in a slightly unusual way. For example, a driver calling udelay() from the interrupt handler. The sheer complexity of the code base can make tracking down such issues a painful experience. This is further amplified by the existence of certain invariants provided by the Linux kernel but absent in the Linux DDE. One particular source of trouble is the control flow in the event of an interrupt. Within the Linux kernel, the interrupt handler can make the assumption that no code of the interrupted CPU can be executed until the interrupt handler returns. In contrast, Linux DDE models interrupts as independent threads and assumes that all code is multi-processor safe. Consequently the control flows of the driver executed in the Linux kernel and the same driver executed in Linux DDE differs in subtle ways, leading to the worst of all bugs namely race conditions. While our focus shifted away from the classical Linux DDE, we discovered the beauty of creating extremely tight device-driver environments. In contrast to the Linux DDE, which tried to be useful for a large range of driver classes on the cost of becoming complex, we created new slim DDEs for single drivers or a strictly outlined class of drivers. One example is the DDE for iPXE networking drivers. The iPXE boot loader covers most of today's commodity network cards. The drivers of iPXE are actually Linux drivers adapted to be executed in an environment as minimalistic as a boot loader. It turns out that a DDE of less than 1.000 lines of code paves the way towards using a rich base of networking drivers (more than 100.000 lines of driver code) on Genode. A similarly positive experience was made for the Intel GEM driver ported from the Linux kernel. The 18.000 lines of driver code require a DDE of less than 3.000 lines of code to reuse the driver on Genode. These success stories motivated us to proceed going into this direction when revisiting our USB driver. Our goal was to replace the aging USB driver, which was based on the original Linux DDE by a new driver conducted via an USB-specific but onion-skin tight DDE. As a general rule, we forbid ourself to modify 3rd-party code. To completely remove race conditions from the picture, we furthermore decided to run the entire driver stack including the handling of client requests with a single physical thread only. This thread manages multiple pseudo-thread contexts using cooperative scheduling. The result is more than convincing for us. With a DDE of less than 4.000 lines of code, we have become able to use the unmodified Linux-3.2 USB stack, which comprises more than 60.000 lines of code. Only 3 lines had to be modified. In contrast to Linux DDE, the 4.000 lines of custom-written DDE code are relatively easy to comprehend. For most of the functions provided by the DDE, the implemented semantics are a rigid subset of the original functionality as found in the Linux kernel. Apparently the knowledge of function usage patterns in a particular driver allows for vast simplifications. Given our self-imposed rule to not modify 3rd-party code, we expect that future updates to new Linux kernel versions will pose much less of a burden. With our current approach of creating rigidly tailored DDEs, we are convinced to have found a healthy balance between the manual effort needed to create and maintain a base of ported device drivers and the utility those driver provide to our system. By addressing more and more concerns of general-purpose computing, we are forced to push the boundaries of the framework beyond the limited scope of special-purpose OSes. The biggest challenge is the accommodation of highly dynamic workload. With respect to managing physical resources, the framework was designed from the ground up with those requirements in mind. So there is a strong basement to build upon. However, another aspect of dynamic systems is the adaptation of the behaviour of components at runtime. This aspect used to be an underdeveloped spot of the Genode system. With the API improvements of the current release, we supplement the existing Genode concepts with profound support for dynamic policies. To give a few examples of such dynamic policies: We expect the audio mixer to immediately respond to adjusted volume settings. The calibration of pointer devices might be adapted on-the-fly by the user. We want to change the color scheme of the GUI without the need to restart the GUI server. Screen resolutions or the size of text terminals shouldn't be fixed at the start time but changeable. Also policies such as the assignment of devices to subsystems are subject to decisions taken at run time rather than at system-integration time. Of course, each of those problems could be addressed individually by adding dedicated RPC interfaces to components that support run-time adjustments. For example, a touchscreen device driver could sport an RPC interface for allowing the modification of calibration parameters. But the information supplied via such configuration interfaces tends to have a high overlap with configuration information passed to components via Genode's configuration mechanism, which ultimately leads to uncertainty about whether to supply such information via the configuration mechanism or via RPC. The RPC approach also raises the question of how to initialize dynamic configuration arguments such that the component can operate before being explicitly configured via RPC. In the best case, a component would accept both, a static configuration supplied via the existing configuration mechanism and a dynamic configuration interface exposed via RPC. Obviously, this spoils the principle of functional orthogonality, making the component hard to test and maintain. In the worst case, a component may drop the possibility for static configuration altogether and just rely on configuration parameters provided via RPC. This way, we introduce a mandatory dependency of the component from a corresponding configuration component. There must be a better solution. Fortunately, there is. The key is to turn the once static configuration mechanism into a dynamic facility. The configuration mechanism uses the ROM session interface as underlying mechanism. When a process requests a ROM module called "config" by opening a ROM session at its parent, the parent hands out the configuration data of the respective subsystem via a pseudo ROM dataspace. The process can then attach this dataspace to its local address space to access the configuration information. This information is typically expressed as XML, which makes the mechanism powerful enough to handle arbitrarily structured configuration data. Until now, most components used to request the config dataspace only once at their start time. Once obtained, the policy remained in effect for the whole lifetime of the component. We can turn this static mode of operation into a dynamic one by letting the component query for a "config" ROM module not only once but repeatedly during its lifetime. Each time, the program requests its configuration, the parent may hand out a dataspace with updated information. The code for parsing the "config" data in the configured component is already there. The only change is that the code is executed not once but multiple times. Of course, having each component poll for configuration changes at their parent at regular intervals won't scale too well. Components should obtain a new config dataspace only if there is an actual change. To enable the parent to notify the component of such changes, we enhanced the ROM session interface with a signalling mechanism. The client (in our case this is the child process) can register a signal handler that will get notified each time the ROM module changes. On the reception of such a signal, it can re-evaluate the configuration information. Of course, the configuration file handled by the init process remains to be static because init is meant to handle the static portions of the system only. But dynamic config files can be used in three different ways already: First, requests for config files can be routed to arbitrary ROM services instead of the immediate parent. The remote ROM service may support the dynamic update of ROM modules and provide the signalling. An example for such a dynamic policy component can be found at os/run/dynamic_config.run. In structure, this scenario corresponds to the approach of having a dedicated policy component define the runtime policy of a server. But in contrast to the native approach, the dynamic_config.run scenario solves the initialization problem by letting the configured component use the policy provider as a service. The second way of employing dynamic configurations is to run a service as a child subsystem using the Slave API. An example for this scenario is provided by os/run/dynamic_config_slave.run. The third variety is the use of the loader service to instantiate subsystems. The ROM modules of such subsystems can not only be defined by the client of the loader but can be updated at any time using dynamic ROM sessions. An example for the latter variant can be found at os/run/dynamic_config_loader.run. This function allows a ROM session client to register for events referring to the session's ROM module. At first sight, it might be counter intuitive to expect events originating from such sessions because the most prominent provider of the ROM service is core, which exports static binary data loaded at boot time to higher-level components. Naturally, such boot-time modules never change. But ROM sessions are used elsewhere, in particular by parent processes for supplying read-only information to child subsystems. For instance, shared libraries, executable binaries, and configuration data are passed to child subsystems as ROM modules. But in contrast to core's ROM modules, this information may be dynamic in nature. For example, the configuration of the audio mixer may change at any time during the lifetime of the mixer. Also executable binaries may change in the event of system updates. Enabling the system to respond to such changes is crucial the use of Genode as general-purpose OS. For existing users of the ROM session interface, there is nothing to consider. API compatibility is maintained. However, by installing a signal handler using the sigh() function, the client will receive a notification each time the data changes at the server. From the client's perspective, the original data contained in the currently used dataspace remains unchanged until the client calls dataspace() the next time. This way, the update of the ROM module at the client side is transactional. There is no inconsistent intermediate state. Via the newly added executable flag of Rm_session::attach(), clients of the RM service become able to express whether they want a mapping to be executable or not. This allows dataspaces to be mapped as non-executable by default and as executable only if needed. On some platforms, in particular Linux, we used process-local pseudo capabilities as helpers to implement the Genode API. In contrast to a normal capability, which refers to an object accessible via RPC, a pseudo capability is not more than a glorified pointer. The uses of local pseudo capabilities are normally constrained to special cases in platform-dependent code. They do not exist at API level. However, our observation of the need for such a utility for platforms other than Linux prompted us to generalize the local capabilities. The result has been incorporated into the platform-independent base repository as part of the Native_capability_tpl interface. At API level, this change is transparent. The original loader service was primarily motivated by the browser-plugin scenario presented on our live CD. But since the initial version, we envisioned this component to become the generic mechanism of choice for scenarios where subsystems are to be created and removed dynamically at runtime. The current release introduces a largely revised loader-session interface and a new implementation of the loader component. The new version widens the application scope of the service and, at the same time, reduces its implementation complexity. The complexity reduction is achieved by removing the original limitation of supplying the new sub system as a single binary blob only. The server used to implement heuristics and functionality for dealing with different kinds of blobs such as ELF images or TAR archives. This has been replaced by a session-local ROM service, which can be equipped with an arbitrary number of ROM modules supplied by the loader's client prior starting a new subsystem. Even though the TAR support has been removed, a separate instance of the tar_rom service can be used within the subsystem to provide the formerly built-in functionality. The new loader component is best illustrated by two examples. The traditional loader example at os/run/loader.run shows how the loader intercepts the nitpicker session of the loaded subsystem. The corresponding source code can be found at os/src/test/loader/. The second example at os/run/dynamic_config_loader.run shows how the concept of dynamic ROM sessions can be combined with the loader. As demonstrated by this example, ROM images used by the loaded subsystem can be updated at runtime by the client of the loader session. The current release introduces Genode's file-system session interface, provides a first implementation of this interface in the form of an in-memory file system, and enables the libc to use the new file-system facility. The new interface resides in os/include/file_system_session/. It uses synchronous RPC calls for functions referring to directory and meta-data handling. For transferring payload from/to files, the packet-stream interface is used. We envision that the asynchronous design of the packet-stream interface fits well with the block-session interface and thereby allows for hiding I/O latencies when performing subsequent requests in an asynchronous way. Compared to Unix-like file-system APIs, Genode's file-system session interface is much simpler. In particular, it does not support per-file permissions. On Genode, we facilitate binding policy (such as write-permission) as sessions rather than individual file objects. As reference implementation of the new interface, a new ram_fs service can be found at os/src/server/ram_fs. It stores sparse files in memory. At startup time, ram_fs is able to populate the file-system with directories, ROM modules, and inline data as specified in its configuration. Access to the file system can be tailored for each session depending on the session's label. By default, no permissions are granted to any session. To selectively permit access to (a part of) the file system, at least one policy must be defined. The following configuration illustrates the way of how to express policy. The <content> sub node of the <config> node provides a way to pre-populate the file system with directories and files. Note that <dir> nodes can be arbitrarily nested. Files can be loaded from the ROM service. By adding the optional as attribute to a <rom> node, the file name can be defined independently from the ROM module name. In addition to creating files from ROM modules, files can be created from data specified directly as part of the configuration using <inline> nodes. The content of such nodes is used as file content as is. Session-specific access-control policy is expressed via one or more <policy> nodes. At session-creation time, each policy node is matched against the label of the new session. If the label of a policy node matches, the defined policy is applied. If multiple policies match, the one with the longest label attribute (the most specific one) is selected. A policy node may contain the following attributes. The mandatory root attribute defines the view port of the session onto the file system. The optional writeable attribute grants the permission to modify the file system. To illustrate the use of the ram_fs component, refer to the libports/run/libc_fs.run script. The current state should be regarded as work in progress. In particular, the error handling and the life-time management of file-system nodes will need further attention. Functionality-wise, the support for truncating files and symbolic-link handling are not yet implemented. Furthermore, there is much room for optimization, in particular for the handling of directory entries. Currently, we communicate only one directory entry at a time, which is suboptimal when traversing large trees. However, we decided to focus on functionality first and defer optimizations (such as batching directory entries) to a later stage of development. The current implementation does not handle file modification times at all, which may be a severe limitation for tools that depend on this information such as GNU Make. 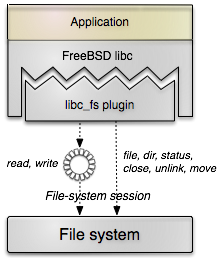 To enable libc-using programs to access the new file-system interface, there is a new libc plugin at libports/src/lib/libc_fs. Using this plugin, files stored on a native Genode file system can be accessed using the traditional POSIX file API. To see how the three parts described above fit together, the test case at libports/run/libc_fs can be taken as reference. It reuses the original libc_ffat test to exercise several file operations on a RAM file-system using the libc API. The new pthread library implements a subset of the POSIX thread and semaphore API. We plan to extend it as needed. Currently, it is used as support for the libSDL-based avplay program. The setjmp/longjmp facility comes with the libc but it is fairly free-standing code, which is useful not only for libc-using programs but also for raw Genode components, in particular the new USB stack. Therefore, we separated the setjmp/longjmp code into a separate libc-setjmp library. Even though the library is prefixed with libc it does not depend on the remaining parts of the C runtime. The main-function arguments of Genode programs were never used by genuine Genode components because the Genode's configuration concept is the most adequate and consistent way of passing parameters to components. But most components ported from other systems and not specifically developed for Genode, expect configuration arguments passed via the argc-argv interface. One way to reuse such components is to change their way of handling arguments by the means of patching 3rd-party source code. In some cases (for example for the Vancouver VMM), this is the preferred way because manual adaptation work is required anyway. On the other hand, there are 3rd-party applications that would be nice to reuse as is without any manual patching work, for example the libSDL-based avplay or the muPDF application. To ease the integration of such programs into Genode setups, we added the new config_args library. At the startup of the program, this library inspects the config node for arguments and fills the argv structure to be passed to the main() function. The value attribute of the first <arg> node becomes argv0 and so on. We added the API call dde_kit_timer_schedule_absolute to the DDE Kit interface. Traditionally, DDE Kit timers used to be disposed after a single use. But we learned that there exist use cases for reusing a single timer object for multiple subsequent timeouts. The schedule_absolute function accommodates those scenarios. The new LOG-to-terminal component to be found at os/src/server/terminal_log provides the LOG service by writing each LOG-output request prefixed by the session-label to a terminal-session. It thereby enables the routing of LOG output to different kinds of terminal sessions such as UART drivers, the graphical terminal, or the TCP terminal. The gems/run/terminal_log.run script demonstrates the usage of the new component. The blitting library employed by nitpicker and other GUI applications used to come in the form of two implementations. The generic version implemented the copying operation via Genode's memcpy function, which conducts a simple byte-wise copy at relatively poor performance. In practice, the generic fall back was expected to not being used much as there is an assembly-optimized implementation for x86 machines. Because there wasn't an ARM-specific implementation available yet, ARM platforms suffered under the poor performance of the generic fall-back implementation. To bring the blitting up to speed on such platforms, we supplemented the blitting library with an ARM-specific optimized version. Qoost is a small library developed by Genode Labs for making the development of Qt4-based applications, in particular applications using QWidgets, more enjoyable. The library is currently used by the new Qt4-based video player example at qt4/src/app/qt_avplay. Zlib as been updated because the previous version mysteriously disappeared from the official zlib mirrors. The libav project is one successor of the popular FFmpeg library, which is a comprehensive solution for video and audio decoding, conversion, and streaming. The version 0.8.2 of libav has been incorporated into the libports repository. The current release of Genode includes initial support for the Lua programming language, a clean scripting language with excellent portability capabilities - just ANSI C. Lua comes with a tiny runtime implementation, which recommends it as base for test scripting or rapid prototyping in Genode. Currently, the Lua libraries are accompanied by a small test program test-moon, which utilizes the C++ variant of the Lua runtime. The test shows an exemplary integration of Genode interfaces to print the RAM quota and sleep for several seconds. The simplicity of the application shows the potential of this approach. In the future, essential Genode interfaces could be made available to Lua scripts as libraries or classes and test-moon could be extended to a versatile test tool, which loads and runs test scripts configured with Genode's config mechanism. Test results can be aggregated, printed, and analyzed at runtime by scripts. Motivated by our work on media replay capabilities, we enhanced the port of libSDL with support for timer, thread, and audio-related functions. Basic support for SDL timers and delay functions has been added. Thanks to the minimal support for pthreads added by the means of the new pthread library, we are able to activate the SDL thread API. The most common threading and synchronization primitives work but not all features are supported. We will complement the coverage of support as needed. The new libSDL audio back end enables the use of Genode's audio-session interface from SDL applications. This way, SDL programs can be combined with audio drivers as well as with the mixer component. Note that the SDL audio back end does respond to configuration changes at run time. By supplying the config dynamically rather than via a static file, the audio volume may get updated while the SDL application is running. We refined the GDB monitor to facilitate its use for debugging ever more sophisticated scenarios. One of those scenarios is executing the Noux environment within GDB. To execute a meaningful Noux scenario, we need a way to pass configuration data through the GDB monitor to the debugging target. This feature has been implemented by adding a new <config> subnode to the <target> node at the GDB monitor configuration. The current release features the initial version of a natively running media player. It consists of the following pieces. is a framework library for decoding, converting and streaming audio and video data. The libav library has been incorporated into the libports repository. is an example application, which showcases the use of libav using libSDL to integrate with a host OS. Thanks to our port of libSDL to Genode, we are able to use the avplay application without modification. When used on Genode, avplay uses a framebuffer session, an input session, a timer session, and an audio-out session as back ends. 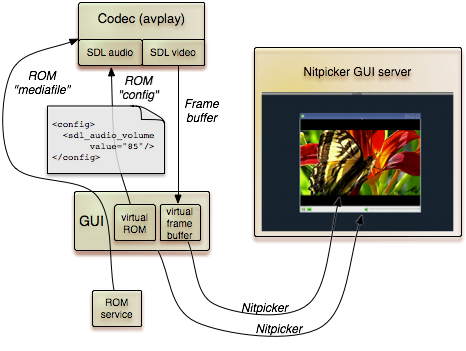 Thereby we are able to integrate avplay seamlessly with existing components that provide these interfaces, in particular the audio mixer, framebuffer and input drivers, but also the nitpicker GUI server. is a Qt4 front end to avplay. It spawns an instance of avplay as a slave process. The unmodified 'avplay' embedded in Qt4-based GUI. The media file was downloaded from http://www.youtube.com/watch?v=CbtAP3kUCxs. The latter part is particularly interesting because it makes creative use of Genode's unique service virtualization facilities. The qt_avplay program (GUI) starts avplay (aka the codec) as a separate child process. When started, the codec requests a framebuffer session from the GUI. 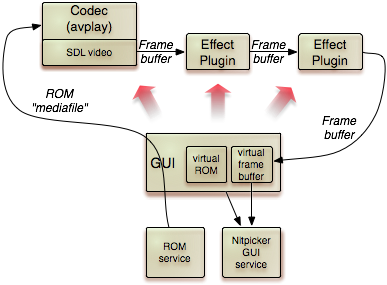 The GUI, in turn, creates a separate session to the nitpicker GUI server specifically for displaying the codec's output on screen and hands out the buffer returned by nitpicker to the codec. However, the GUI retains the privilege to control the way how the buffer is displayed on screen. By using the QNitpickerViewWidget, the GUI is thereby able to embed the codec's view seamlessly into the Qt4 GUI as a widget. But both the GUI and the codec have completely independent data paths to the GUI server. So the operation of the codec does not depend on proper and timely operation of the GUI. Vice versa, the GUI process cannot be compromised by the codec because the codec is sandboxed in a separate process. The GUI interacts with the codec by virtualizing the input session interface used by the codec. I.e., when the user clicks on the play or pause button, the GUI submits artificial keyboard events with key codes interpreted by the avplay program. Besides the separation of the codec from the GUI, the qt_avplay example is interesting because it makes use of Genode's new dynamic configuration facility. The SDL audio back end used by the codec repeatedly evaluates its configuration during runtime. This configuration includes a volume prescale factor. Via the dynamic configuration mechanism, the parent (the GUI) is able to update the value of the volume prescale factor at any time and thereby influence the behaviour of the codec. Furthermore, the concept of running avplay as a slave of the GUI clears the way to even more sophisticated features such as the transparent addition of video post-processing steps in the form of individual components. Instead of connecting the codec directly with the nitpicker session, the GUI may decide to route the framebuffer-session request to another slave (aka "effect plugin"). The effect plugin is a component that requests a framebuffer session at its parent (the GUI) in order to provide a framebuffer service itself (to the GUI). Each time, its client invokes the refresh() function, the effect plugin transforms pixels targeting its own framebuffer session. By routing the framebuffer session between the codec, one or more instances of effect plugins, and the nitpicker GUI server, any number of effect plugins can be chained together to form a pipe of video-processing components. All this flexibility comes with no addition to the Genode API. It is merely the result of composing plain Genode components. Our custom terminal emulator that is hosted within the gems repository has been enhanced to support tab characters as well as the escape sequences needed to use ls –color=auto. The new dde_linux repository will host device drivers ported from the Linux kernel. In contrast to the original linux_drivers repository, dde_linux does not contain any 3rd-party source code. To download the Linux kernel source code and extract the drivers, execute the make prepare rule of the top-level Makefile. The initial version of the dde_linux repository comes with a USB driver. The porting methodology follows the path of the Intel GEM port. Instead of attempting to provide a generic Linux environment that works across drivers, each driver comes with a specially tailored DDE. The DDE consists of Genode-specific implementations of Linux API functions as declared in lx_emul.h. Most of these functions are dummies that must merely be provided to resolve dependencies at the linking stage. They are called by unused code-paths. As of now, the USB driver supports UHCI and EHCI on the x86_32 platform. It exposes USB HID devices and USB storage devices via Genode's input-session and block-session respectively. Note that we observed that certain 1.0 versions of Qemu do not generate mouse interrupts. The mouse driver should work correctly on Qemu 1.0.93 and above. We introduced support for stacked file systems alongside new glue code for accessing File-system implementations provided via Genode's new file-system-session Interface. Using stacked file systems, an arbitrary number of file systems (such as TAR archives or file systems implemented as separate Genode Components) can be composed to form one merged virtual file system. An example is given via the ports/run/noux_bash.run script. This run script creates a virtual file system out of multiple TAR archives each containing the content of a particular GNU package. In addition, one ram_fs is mounted, which enables Noux to perform write operations. This way, the shell output can be redirected to a file, or files can be saved in VIM. With the implementation of stacked file systems and the writeable RAM file system in place, we are ready to greatly extend the range of GNU packages that run (almost) unmodified on Genode. For us, the most important achievement is the new ability to run binutils, the GNU compiler collection, and GNU Make. To see Noux executing gcc and readelf, please give the ports/run/noux_tool_chain.run script a try. Executing binutils and GCC has been successfully tested on OKL4, L4/Fiasco, and L4ka::Pistachio. Fiasco.OC, NOVA, Linux, and Codezero are not yet supported. We desire to use a wide range of Unix networking tools such as wget, lynx, ssh, and netcat on Genode. For this reason, the second focus of our Noux-related developments is the added support for networking. The Noux syscall interface has been extended with system calls for socket, getsockopt, setsockopt, accept, bind, getpeername, listen, send, sendto, recv, shutdown, connect, and getaddrinfo. Within Noux, those system calls are translated to calls to the libc and the libc-lwip plugin. This design principally enables us to easily replace the TCP/IP stack in the future if needed. To experiment with the new networking support of Noux, you may use the ports/run/noux_net_netcat.run as a good starting point. The test communicates a message between two instances of netcat one running on the host system and one running within the Noux runtime in qemu. By now, the Fiasco.OC base platform was still lacking proper handling of kernel resources especially the tracking and releasing of capability selectors. With release 12.02 we introduced a capability map for Fiasco.OC to circumvent the usage of more than one kernel-selector for the same capability (please, refer to the release notes 12.02 for further details). With the current release we turned the capability class of the Fiasco.OC base platform into a smart-pointer-like object which releases the corresponding entry from the capability map whenever it detects that a capability gets unused. Thereby leaking of kernel resources in terms of capability selectors gets eliminated. A patch for the l4_task_cap_equal syscall in Fiasco.OC was added, that fixes some false positives, meaning: when comparing two capability selectors that referenced the same kernel object including the same, rights false was returned. With the current release we introduce basic support to build Genode/Fiasco.OC for the popular PandaBoard OMAP4 platform. Although most needed drivers are still lacking, it is at least possible to see core, init, and other applications via serial line running on the PandaBoard. The Fiasco.OC kernel debugger's object name buffer was too limited for most Genode scenarios incorporating more than just a handful of threads. That complicated debugging sometimes. An additional kernel patch extends the name buffer. When used as component framework on Linux, Genode tries to preserve as many native Linux features as possible. In some instances, those features go surprisingly well with Genode. One particular feature is Linux' chroot mechanism, which is a popular way to execute Linux processes in a jailed environment. When using Genode, the reliance on a file system is naturally reduced to a minimum because the framework comes with abstractions vastly different from a classical file system, namely capability-based naming of resources. Still, the file system is there and can be exploited. In theory, segregating different parts of Genode into different chroot environments can improve the situation. In practice, the use of such platform-specific solutions raises the question of how to integrate the solution in way that is coherent with the rest of the framework. The remaining part of the configuration is identical to the configuration of init. In fact, under the hood, the chroot component is barely more than a trampoline mechanism for spawning the actual init binary after taking all precautions needed to setup the chroot environment. To see how to deploy the new facility, please refer to the run script at os/run/chroot.run. The run script uses POSIX file capabilities to allow the use of the chroot component under the account of a normal user. However, for granting the needed capabilities, the run script will ask for root permission. Up to now, the Genode API provided no way to devise the use of non-executable memory mappings. There is only the distinction between read-only and read-writable dataspaces. This limitation becomes a severe limitation when combining Genode with PaX. This prompted us to introduce the executable flag to the Rm_session::attach() function using non-executable as the default. So far, Linux is the only platform that evaluates this flag. Only if set, the mmap syscall will enable MAP_EXECUTABLE. This is actually a rare exception. The flag is set by the dynamic linker only. For hybrid Linux/Genode programs (that do use the Linux ld-linux.so instead of Genode's dynamic linker) the executable flag is never set. The hard-coded dependency on a /usr/bin/python2 binary spawned a bit of confusion (or at least an inconvenience) among Genode users. So we introduced simple heuristics for determining the actually installed python-2 version during the make prepare procedure and use the best match. The build system overlays multiple source trees (repositories) such that they can shadow libraries and include search paths. We have extended the shadowing concept to build targets. Furthermore, the change of the build system streamlines the build stage for generating library dependencies, reducing the processing time of this stage by 10-20 percent. Up to now, the run tool used the plain qemu binary for all (non-Linux) x86_32 platforms and resorted to qemu-system-* variants for x86_64 and ARM platforms. To remove this inconsistency, the run tool has been changed to always use the specific qemu-system-* binary.